Gemma Betros examines the problems the Revolution posed for religion, and that religion posed for the Revolution. In 1789, the year of the outbreak of the French Revolution, Catholicism was the official religion of the French state. The French Catholic Church, known as the Gallican Church, recognised the authority of the pope as head of the Roman Catholic Church but had negotiated certain liberties that privileged the authority of the French monarch, giving it a distinct national identity characterised by considerable autonomy. France’s population of 28 million was almost entirely Catholic, with full membership of the state denied to Protestant and Jewish minorities. Being French effectively meant being Catholic. Yet, by 1794, France’s churches and religious orders were closed down and religious worship suppressed. How did it come to this? What did revolutionaries hope to achieve? And why did Napoleon set out to reverse the situation? Historians are divided over the strength of Catholicism in late eighteenth-century France. Some suggest that it was still flourishing after the efforts of the Council of Trent (1545-63) to reform and revitalise the Church, as witnessed by its well-educated clergy, numerous and varied religious orders, and renewed forms of worship. Others trace a period of decline, with a small but noticeable decrease in religious observance in the decades before the Revolution. Regional studies of religious belief and practice reveal significant differences between urban and provincial France, between elites and the rest of the population, and, to a lesser degree, between men and women. What is clear, however, is that the eighteenth-century Church was attracting growing criticism from the philosophes, the intellectuals of the Enlightenment who systematically questioned every aspect of French government and society. The Enlightenment quest to promote reason as the basis for legitimacy and progress found little to praise in the Church. While the philosophes appreciated the value of religion in promoting moral and social order, the Church itself was condemned for its power and influence. The scandal surrounding the divisive theological movement of Jansenism, exacerbated by the heavy-handed treatment of its followers earlier in the century, furnished one reason for attacking the Church’s authority and its close links with the monarchy. France’s lack of toleration for religious minorities provided another. Although the philosophe Voltaire managed some praise for the young nuns who devoted their lives to caring for the sick and poor, the clergy were seen as less useful. The writer Louis-Sebastien Mercier complained in 1782 that Paris was ‘full of priests and tonsured clerics who serve neither the church nor the state’ and who were occupied with nothing but ‘useless and trifling’ matters. Criticism was specifically directed at monasteries where monks and nuns spent their days in prayer, much to the ire of philosophes who thought they should instead be reproducing for the good of the nation. The solemn vows taken by these men and women, binding them to the religious state for life, also led to concerns about individual liberty. Denis Diderot railed against the lifelong nature of these vows, warning about decisions taken too young in life and, in his novel La Religieuse (The Nun), raising the spectre of a young woman forced to be a nun against her will. Although most philosophes promoted reform rather than destruction, their comments gave encouragement to a growing anticlericalism whose spite was sharpened by resentment of the Church’s wealth. The Church’s revenue in 1789 was estimated at an immense – and possibly exaggerated – 150 million livres. It owned around six per cent of land throughout France, and its abbeys, churches, monasteries and convents, as well as the schools, hospitals and other institutions it operated, formed a visible reminder of the Church’s dominance in French society. The Church was also permitted to collect the tithe, worth a nominal one-tenth of agricultural production, and was exempt from direct taxation on its earnings. This prosperity caused considerable discontent, best illustrated in the cahiers de doléances, or ‘statements of grievances’, sent from throughout the kingdom to be discussed at the meeting of the Estates-General in May 1789. Calls for the reform or abolition of the tithe and for the limitation of Church property were joined by complaints from parish priests who, excluded from the wealth bestowed upon the upper echelons of the Church hierarchy, often struggled to get by. When crowds began to gather in Paris on 13 July 1789, the religious house of Saint-Lazare and its neighbouring convent were among the first places searched for supplies and weapons. The Catholic Church may have been the church of the majority of the French people, but its wealth and perceived abuses meant that it did not always have their trust. On the eve of the Revolution, the French state was on the verge of bankruptcy. Repeated attempts at financial reform had floundered but the Revolution opened the way for a new approach that, from the beginning, involved the Church. 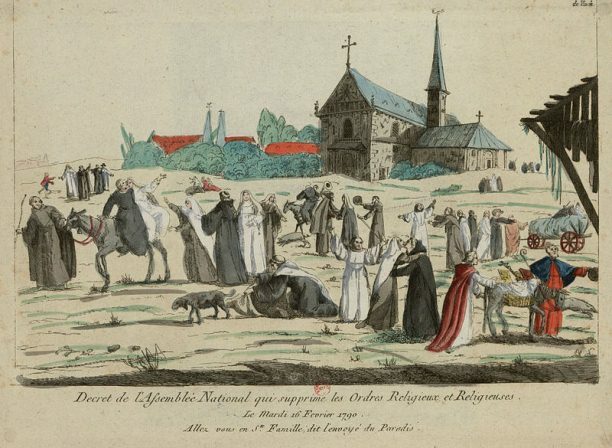 On 4 August 1789, when the remains of France’s feudal past were abolished in a night of sweeping reforms, the clergy agreed to give up the tithe and allow the state to take over its funding. The Declaration of the Rights of Man and Citizen, adopted on 26 August, made no recognition of the special position of the Catholic Church. With all authority located henceforth within the nation, the Church now found itself open – and vulnerable – to further reform. On 2 November 1789, France’s new National Assembly, known as the Constituent Assembly, passed a decree that placed all Church property ‘at the disposition of the nation’. Talleyrand, the bishop of Autun and one of the few clerics to support the measure, argued that all Church property rightfully belonged to the nation and that its return, by helping to bring about a better society, should therefore be viewed as a ‘religious act’. Despite clerical support for the Revolution itself, this decree became the first in a series that targeted the Church in a way that soon cast doubt on the Revolution’s motives. On 29 October 1789, just days before the nationalisation of Church property, the Assembly heard that two women in a nearby convent were being forced into the religious life. A proposal was immediately made to halt the taking of solemn vows. Not only did this development associate the Church with the scheming and corruption featured in the anticlerical literature of the eighteenth century, but it prepared the way for the closure of France’s monasteries and the departure of their inhabitants, decreed on 13 February 1790. It was hoped that the quick sale of monasteries and their contents would help stabilise the nation’s finances. The announcement was met with thousands of letters of protest. The new French state had not only taken control of the Church’s revenue and property, but, through such radical intervention, seemed to be redrawing the boundaries between church and state. Charged with the Church’s financial administration, the Assembly now took the opportunity to reorganise it. On 12 July 1790 the Assembly approved the Civil Constitution of the Clergy, a constitution whose very name reflected the state’s new control of Church affairs. Among the constitution’s reforms, dioceses were redrawn in line with state administrative divisions, clergy were to be paid by the state according to a new salary scale, and priests and bishops were to be elected by citizens. The pope’s refusal to approve the Constitution, together with growing criticism from conservative members of the Assembly, began to cast doubt on the Church’s support. In an attempt to resolve the issue, the Assembly decreed on 27 November 1790 that all clergy must take a public oath of loyalty to the Constitution or surrender their salary and position. As Nigel Aston has suggested, this oath became ‘a referendum on whether one’s first loyalties were to Catholicism or to the Revolution’. Figures varied considerably between regions, but over 50 per cent of parish clergy swore their loyalty to the Constitution. For others the oath presented a grave matter of conscience eased only on 13 April 1791 when the pope, who had been hesitating, issued his condemnation. Those who took the oath became known as ‘jurors’, while those who refused were labelled ‘non-jurors’ or ‘refractory priests’. A growing number fled overseas, joining those nobles and clergy who had already emigrated rather than live under the revolutionary regime. The French population gradually split between those who supported the ‘Constitutional Church’ and those who remained loyal to refractory priests, initially allowed to continue practising. Rather than confirming the allegiance of French clergy to a state-operated church, the oath had put before them a decision that, by forcing them to choose between the Constitutional Church and Rome, would cause a schism among French Catholics for the next decade and generate hostility towards the Revolution and its aims. Meanwhile, support for the refractory Church became increasingly associated with counter-revolution. Émigré priests and bishops preached against the Revolution from abroad, while the refractories that remained became a focal point for broader resentment of the Revolution. The suspicion with which many people viewed constitutional priests, especially in parts of regional France, helped create popular support for the counterrevolutionary cause. This association had immediate implications. In the first week of April 1791, the sisters of a Parisian religious congregation were attacked by crowds of women who accused them of teaching ‘false principles’ to children and plotting counter-revolution with refractory priests. Such sentiments found official expression in the debates of the ‘Legislative Assembly’, formed in October 1791 and determined to carry through the policies of the early Revolution. In November it stopped the pensions of refractory priests and prohibited their use of religious buildings. On 6 April 1792 it banned all forms of religious dress, seeking to abolish this visible reminder of the ancien régime and force people to see priests as ‘citizens like any others’. France’s declaration of war on Austria on 20 April 1792 and its early losses cast further suspicion on refractory clergy and their followers, now suspected of plotting with the enemy. The fall of the monarchy on 10 August provided added impetus for the destruction of anything connected with the ancien régime. The Assembly suppressed all remaining religious orders, including those staffing schools and hospitals, and ordered remaining non-jurors to leave or be arrested and deported. Concern peaked on 2 September when news arrived that the fortress-town of Verdun near Paris had fallen to the allied Prussian forces. Parisians, imagining that imprisoned counter-revolutionaries were preparing to break out and join the enemy, dispensed their own preventative justice when they descended on the city’s prisons and, over the course of several days, slaughtered over 1200 prisoners, including at least 200 priests. The September Massacres made clear the distrust that would prevent any accommodation between the Church and the new Republic proclaimed on 22 September 1792. The new Republican government, known as the Convention, responded to growing civil unrest and the ongoing overseas threat with the Reign of Terror. The Revolutionary Tribunal, established on 10 March 1793, aimed to demonstrate that persons of danger to the Republic were being identified and punished. Laws of September 1793 and June 1794 targeting ‘enemies of liberty’ and ‘enemies of the people’ saw mounting numbers of priests and nuns arrested and placed on trial. Their charges included not only counter-revolution but ‘fanaticism’ and possession of items used in the celebration of mass, again demonstrating the suspicion now attached to religious worship. Only a small percentage were guillotined, but their trials – designed to set an example – instead garnered further support for counterrevolutionary forces in the Vendée and other parts of western France and drove religious practice underground. Although the Constitutional Church had been permitted to continue its work, the Convention now considered Catholicism in any form suspicious. Its association with ancien régime France, its adherence to values not of the Revolution’s making, and the private nature of worship seemed incompatible with the values of the Republic. From here sprung a movement referred to as ‘dechristianisation’, which aimed to excise religion from French society. Constitutional priests were advised to abandon the priesthood and were encouraged – or in some cases forced – to marry. Any priest that continued to practise, whether constitutional or refractory, now faced arrest and deportation. In October 1793, public worship was forbidden and over the next few months all visible signs of Christianity were removed, a policy pursued with particular enthusiasm by revolutionary armies eager to seek revenge on the institution that harboured so many counter-revolutionaries. Church bells were pulled down and melted, ostensibly to help the war effort, crosses were taken from churches and cemeteries, and statues, relics and works of art were seized and sometimes destroyed. Such iconoclasm caused considerable concern at official levels, not least because of the destruction wrought on France’s artistic and cultural heritage. On 23 November 1793, churches were closed, to be converted into warehouses, manufacturing works or even stables. Streets and other public places bearing the names of saints were given new, often Republicanthemed names, and time itself was recast to further repudiate France’s Christian past. The Revolutionary calendar started with the advent of the French Republic (Year 1). The names of its months reflected the seasons and its ten-day week eliminated Sunday as a day of rest and worship. Although such measures were unevenly applied, and in many cases met with considerable local opposition, they reinforced the message that Christianity had no place in the Republic. The revolutionary government had learnt, however, that when destroying the past, it was wise to have something to put in its place. The creation of the Republic in 1792 had given rise to ceremonies and festivals that aimed to make a religion of the Revolution itself, commemorating revolutionary martyrs as its saints and venerating the tricolour cockade and red liberty cap as its sacred symbols. Prominent among such revolutionary ‘cults’, as they were known, was the Cult of Reason which recognised no god but instead worshiped the goddess of reason in the former churches, now known as ‘temples of reason’. Robespierre, wary of atheism and the political forces behind certain cults, introduced on 7 May 1794 the Cult of the Supreme Being, which he envisaged as a new state religion. Its recognition of a supreme deity would, it was hoped, attract and harness the persistent desire for religious belief and worship among French men and women while its proclamation of the soul’s immortality would encourage moral behaviour of the type that would ensure a stable and virtuous Republic. But the Festival of the Supreme Being, held on 8 June 1794 throughout France and presided over in Paris by Robespierre, provided little beyond spectacle and, like other cults, it attracted minimal interest outside urban centres. Catholicism had been squeezed out of the Republic, but alternatives imposed from above failed to catch on. The fall of Robespierre in July 1794 brought a thaw towards religious practice. Dechristianisation had forced religious observance into the privacy of the home. With the emigration and abdication of so many priests, and the disruption of regular forms of worship, the laity had become accustomed to taking over services, even performing ‘white masses’ when there was no priest available. The Convention, anxious to achieve some form of stability, recognised that somehow it would have to accommodate this private worship. It did so by announcing on 21 February 1795 the formal separation of Church and State. Churches were reopened, refractory priests were released from jail, and both constitutional and refractory priests were permitted to practise on the condition that they promised to respect the laws of the Republic. Yet complete separation proved impossible. Religion was still considered a threat and subsequent decrees sought to monitor worship and ban outward signs of religion, such as statues or religious dress, from the public eye. Royalist uprisings led to the reapplication of earlier laws concerning refractory priests, as did the coup of 18 Fructidor (4 September 1797), which saw thousands of refractory priests arrested yet again. Like earlier governments, the Directory (November 1795-99) tried introducing alternatives to Catholicism, notably in the new cult of Theophilanthropy. Yet again, these failed to gain popular support. The Directory instead witnessed a religious revival in which Catholic men – and especially women – played an important role in re-establishing their faith around the wreckage left by the Revolution. Any new regime would have to acknowledge this revival and, if it wanted to ensure the loyalty of France’s Catholics, make a place for a Church that could bridge the divisions, confusion, pain, and bitterness of the previous decade. Napoleon came to power in 1799 ready to accommodate the continued presence of religious belief and practice in French society, not least in order to dampen counter-revolutionary opposition. Writings from his youth show that Napoleon had little time for religion but, much like the philosophes, he saw its uses for society. He also appreciated its costsaving benefits, demonstrated by the state-sponsored re-establishment of religious congregations to run hospitals and schools. Above all, Napoleon recognised that if relations were mended with the Church, it could be used to promote and consolidate his rule throughout France. Ignoring objections from revolutionary opponents of the Church, Napoleon set about formalising its place in France in a way designed to ensure that loyal membership of the Church and the state were no longer mutually exclusive. At 2am on 16 July 1801 France signed with Rome a document known as the Concordat, the product of eight months of gruelling negotiations. Catholicism was henceforth to be recognised only as ‘the religion of the vast majority of French citizens’, a description that denied the Church any privileged place within the state, and the Church was to give up all claims to property lost during the Revolution. The Concordat’s most dramatic step, however, was to bring the Church under the authority of the state. In measures that recalled the Civil Constitution of 1790, all clergy were required to swear an oath of loyalty to the government, their salaries were to be paid by the state, and dioceses were again redrawn and aligned with administrative divisions. In addition, all bishops were to be appointed by Napoleon, further minimising Rome’s authority. This trend was confirmed in 1802 with the addition to the Concordat of the ‘Organic Articles’, 27 articles developed and announced without consultation with Rome. Article One, requiring that all instructions from Rome be approved by the government, suggested that in this new relationship, papal authority meant little. Napoleon’s Church, like the Gallican Church of the ancien régime, had its own national identity. Somewhat predictably, relations with Rome soon deteriorated, culminating in what Geoffrey Ellis has described as ‘one of the most extraordinary conflicts between temporal power and spiritual authority history has ever known’. Napoleon increasingly sought to associate his personal rule with the Church, insisting on the pope’s attendance at his coronation ceremony in Paris in 1804, introducing a feast day for the rediscovered ‘Saint Napoleon’, and using the Imperial Catechism, recited by children at Sunday School, to suggest that his reign was authorised by God himself. Yet even as he did so, Napoleon’s disdain for Rome became ever more apparent. Not only did he export revolutionary policy concerning religion by closing down monasteries and seizing Church property, but he introduced the Concordat in conquered territories, bringing the Catholic Church in other countries under his rule. Napoleon’s occupation of Rome in 1808 brought the relationship to breaking point and led to the Pope’s decision to excommunicate him. In retaliation, Napoleon had the pope arrested and later taken to France as his prisoner where he remained until 1814. A new concordat, signed at Fontainebleau in 1813, attempted to ‘put an end to the differences’ between the two, but this also failed. By making the French Church, as well as its spiritual head, so subservient to state authority, Napoleon had created tensions that served over the course of his reign to further divide its members and increase their loyalty to Rome. The wholesale destruction of Catholicism had been far from the minds of the nation’s representatives in 1789, but financial concerns, when combined with external and internal threats, eventually made a full-scale attack on the Church and all connected with it a necessity for a Revolution that demanded absolute loyalty. Nicholas Atkin and Frank Tallett see the French Revolution as ‘a watershed for Catholicism not just in France but in Europe more generally’. The French Revolution saw the Gallican Church transformed from an autonomous institution that wielded significant influence to one that was reformed, abolished, and resurrected by the state. In this extension of state control, as well as in the targeted destruction of the Church and religious practice, the Revolution represents a key development in the secularisation that would stretch across Europe. But both revolutionary governments and Napoleon were unprepared for the resentment that met state incursion into spiritual matters and the turn to Rome that followed it. The removal of Catholic institutions and their personnel simply forced religious worship into the private sphere and increased the involvement of the laity, trends that would also mark the religious revival that took place in France in the nineteenth century. The consequences of this drastic experiment in the transformation of church-state relations would reverberate in France until the 1905 separation of church and state and are still felt today as states continue to negotiate the sensitive relationship between church, state and religious belief. How far did the nationalisation of Church property reflect hostility towards the Church? In what ways did the requirement of the oath to the Civil Constitution of the Clergy affect France’s priests and bishops? What did revolutionary governments hope to achieve through the introduction of alternative cults? To what extent did Napoleon’s controlled revival of the Catholic Church reflect the Revolution’s failure to eradicate religious belief and practice?